Wood, painted and gilded, with velvet-lined replacement backboard. The designer William Burges showed this cabinet at the International Exhibition of 1862 (South Kensington, London). This Museum purchased it at the 1862 exhibition for £40. The painted decoration is suitably light-hearted, given that the cabinet was designed for storing and serving drinks. It shows an imaginary battle between wines and beers, in which Continental wines, represented by Sir Bacchus, fight with British beers, represented by Sir John Barleycorn. Also represented are female warriors personifying Pale Ale, Scotch Ale, Hock and Champagne. 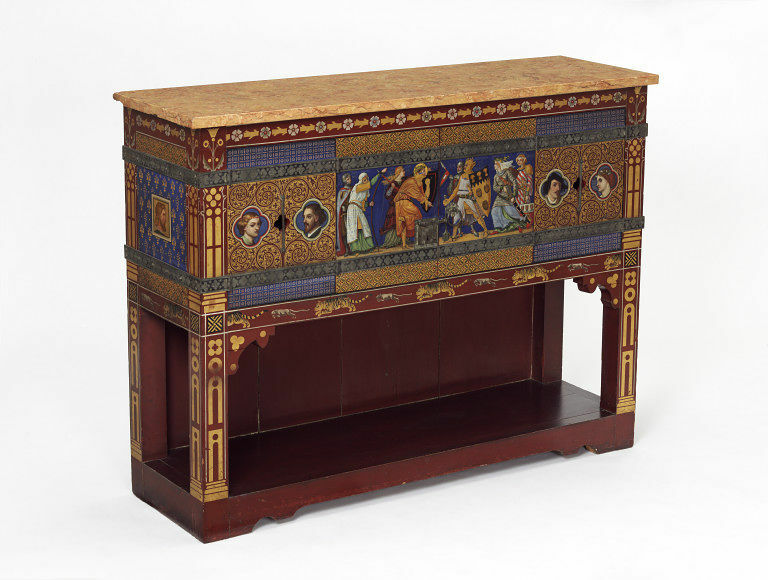 Rectangular sideboard on a stand, with a marble top, the flat surfaces painted with figures and gothic ornament. Above the sideboard is a replacement backboard lined with velvet and supporting a shelf. 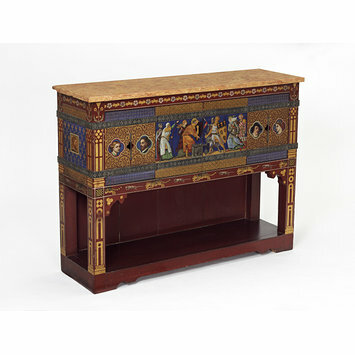 William Burges exhibited this cabinet in the Ninth Architectural Exhibition, held at 9, Conduit Street, Regent Street, London, in 1859. It was exhibited again in the Medieval Court at the London International Exhibition of 1862 where it was purchased by the South Kensington Museum for £40. Photographs of the Medieval Court in 1862 show the sideboard with a high backboard decorated with a pattern of studs. This may be the '"reredos", some five feet high, covered with velvet', described by Mrs Loftie, The Dining Room, page 49, in 1878. The male portrait to the right of the central panel is J.M. Whistler and that to the left of the central panel may be D.G. Rossetti. The two female portraits have not yet been identified. In 1900 the sideboard was on display in the Upper Gallery of the Bethnal Green Museum, with other pieces of furniture to encourage and educate local furniture-making trades. In 1964 the sideboard was lent to the William Morris Gallery, Walthamstow, on long loan. This was originally requested in exchange for one of the painted chairs designed by Burges which was borrowed for display in the new Nineteenth Century Primary Gallery in the V&A. In 1980 the termination of the long loan of the sideboard was requested since it was needed for display in the Primary Gallery and the Burges chair was returned to the William Morris Gallery . Among other Burges cabinets known to have been painted by Poynter are the Cadmus bookcase (Ashmolean Museum Oxford), the Yatman cabinet (also in the V&A), and the Fry cabinet (private collection). Two other known cabinets have Bacchus-related designs: the mirrored buffet with the 'Martyr de St Bacchus' shown at the 1859 Architectural Exhibition and the 1862 London International Exhibition, painted by Nathaniel Westlake and now at the Art Institute of Chicago, and a 'St Bacchus' sideboard similar to the V&A example, but painted by Thomas Morten and now at the Detroit Institue of Arts. Designed by William Burges. Painted by N.H.J. Westlake. Made by S Fisher of Harland & Fisher.